Needless to say it was a tough race, probably the toughest in the Helsby Fell Running Calendar for the year, but some great performances from all Helsby runners to be proud of. Nine runners in total. Special mention once again to Danny Chan wearing a Cheshire vest and being second counter home which is a tremendous achievement! Rachel Arnold also had a storming run beating some County runners in the process. 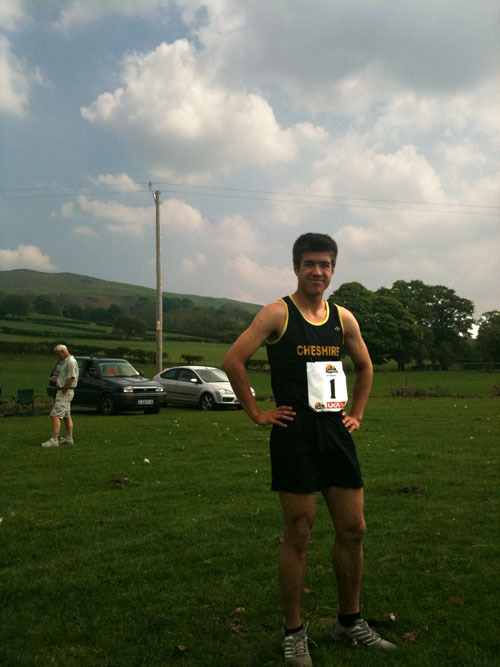 Congratulations to Helsby runner Danny Chan who has been awarded a Cheshire Vest for the Inter-Counties Fell Race, Lletty Farm 22nd May 2010. Good luck to Danny from all at Helsby! With some warm and sunny weather over the last few days it seems that summer might have arrived at last. Evening races are now abundant and the Wednesday night club runs over the Helsby Fells are in full swing. It may therefore come as something of a surprise to learn that we are already a third of the way through the summer road series and a quarter of the way through the fell series. So if you want to compete in the club championship you better get cracking. This years series has already seen a good number of the club members competing. So far the table for the road league sees some familiar names at the top, with Janet Shaw leading in the woman’s Table and Adair Broughton dominating the men’s table with a maximum score in every race competed in and several PB’s to boot. In the Fell series Jane Ashbrook is holding the top spot in the ladies table and I’m predicting that once some holidays and injuries are out of the way will have a few more names competing against her. Probably the most interesting league so far is the men’s fell series. Whilst Adair is holding his customary top spot he is not having it all his own way with Danny Chan scoring maximum points in two of the races. Further down the table the competition is also hotting up with Chris Baynham-Hughes performing well in his first 2 races and several other runners not far behind. 2146 finishers in this years Chester Half Marathon from those runners who braved the course. With a cool start to the day, a little wind, almost ideal weather and as i’ve been told, a lot better than the hailstones of last year! I think this is also David Hartley’s first race for Helsby…..
Full results here and Helsby results below. and if anyone has been doing other events then please let us know! Full report later, but quick mention here of Adair’s superb run at the Chester today …22nd position overall in a good field and sub 80 minutes. Both results to be proud of. I also spotted Mike Hallsworth, Geoff Shaw and Alison Meakin on their way round, but had to get home before the finish. Hope you had a good run all! The presentation evening and AGM will be on Wednesday 27th May. We’re combining the club AGM with our presentation evening. If you object to this and think we ought to allocate more time to AGM business, please let me know and we’ll try and arrange a separate date. We’ll start at 8:30pm (after the Wednesday night run) with the AGM, which we’ll endeavour to keep concise, then a break for a fish and chip supper, then on with the presentation of awards from the club championship race series of 2009/10. Updates via email prior to the event. Pass the message on if you know of anyone missing from the email list. The handicap results will be published at a later date so i’ll forward a link as and when they appear. Well done to all runners who participated in this particular race or any event of the series. as you can see from the Team Results Helsby’s mens team finished bottom of Division 2. It gives us some room for improvement! fantastic news for Helsby Ladies who finished top of Division 2!! Provisional results have been received in .xls for the Christleton 5k held on Friday 7th May. Please contact if you would like a copy. Full results should appear on http://www.ukresults.net very soon. Unfortunately an ex Helsby runner and also a Helsby Club Champion a couple of years ago Mick Charman suffered a heart attack at the end of this race. I believe Mario has spoken to Steph and the latest information we have is that they are keeping him in (The Countess) for tests. If anyone would like to send a get well card or a note to wish him well then please contact me (h99adair@aol.com) and I will provide their address. Let’s hope Mick makes a full and speedy recovery and I know everyone at Helsby would like to wish him well. If you care though, there’s a write-up of the Yorkshire Three Peaks fell race over on my blog at furious cycling. 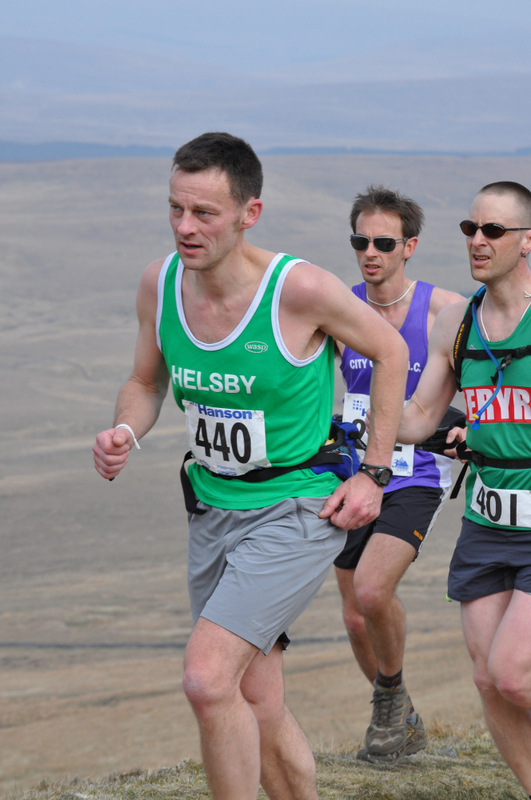 I’d wanted to run the Three Peaks, ever since I’d started to get interested in fell running. The thought of racing over that sort of distance seemed preposterous; so unlikely. That alone was enough to tickle my fancy. Keep those stories coming folks!